ICYMI: Here's a look at the Dodgers' 2019 coaching staff, per Rowan Kavner at Dodger Insider. Notable new editions include Dino Ebel as the third base coach, Robert Van Scoyoc as the new hitting coach, Aaron Bates as the assistant hitting coach and Chris Gimenez as a game planning coach. ICYMI: The made a trade while I was away. Per Steve Adams at MLB Trade Rumors; "Dodgers Acquire Adam McCreery, Designate Pat Venditte." McCreery, who’ll turn 26 on New Year’s Eve, made his big league debut in 2018, though he appeared in just one game and tossed just one inning. He spent the bulk of the season with the Braves’ Double-A affiliate but also pitched in eight games for their Triple-A club. In all, his minor league work resulted in a 3.62 ERA with 11.7 K/9 but a troubling 6.1 BB/9 mark. McCreery has regularly topped 60 percent with his ground-ball rate and has long racked up strikeouts at an impressive level, but the control issues he battled in 2018 were nothing new for him; McCreery has averaged 5.7 walks per nine innings pitched in his career. 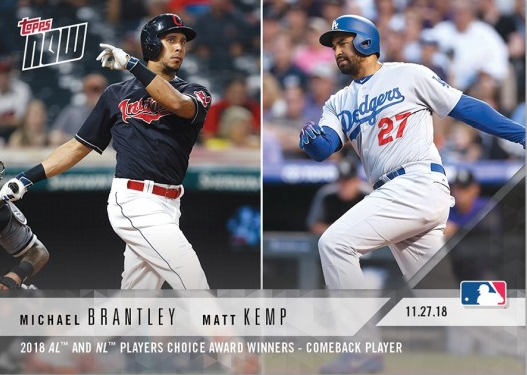 ICYMI: Via Rowan Kavner at Dodger Insider; "Matt Kemp earns Players Choice Award for NL Comeback Player of the Year." 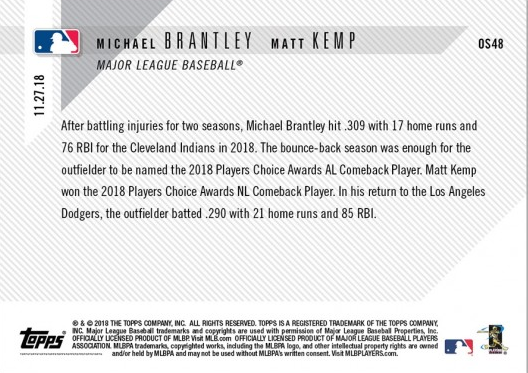 BTW, this award earned Kemp a new 2018 Topps Now card - shared with AL winner Michael Brantley of the Indians. It was issued yesterday. 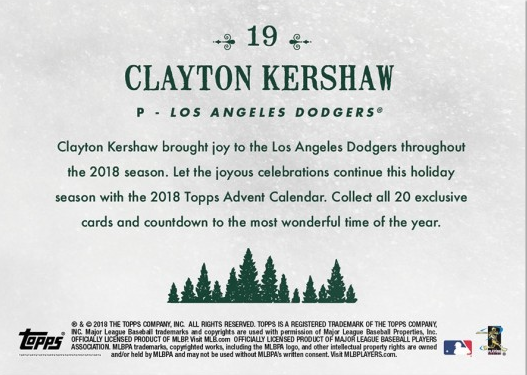 Check out the card below. Here's a rumor. Per Jeff Todd at MLB Trade Rumors; "Dodgers, Padres Pursuing Garrett Richards." The Dodgers and Padres are among the teams pursuing free agent righty Garrett Richards, with Jon Heyman of Fancred reporting that both have made offers. The Los Angeles organization, in particular, is said to be “making a push” to keep the long-time Halos hurler in the region. Per Kyle Glaser at Baseball America; "Drew Saylor Named 2018 Minor League Manager Of The Year." Congrats, Drew! Unfortunately, Glaser also notes that Saylor has parted ways with the Dodgers. Saylor, 34, managed high Class A Rancho Cucamonga to a historic season in 2018. The Quakes won 87 games, tied for second-most in the minor leagues. They went 52-18 in the second half—tied for the second-best record in a half in California League history—despite losing top prospects Gavin Lux, Dustin May and Tony Gonsolin to promotions and Cal League MVP Rylan Bannon, standout starter Dean Kremer and top reliever Zach Pop to the Manny Machado trade. And Rancho finished it off in grand fashion, sweeping Visalia to win the Cal League championship series. Despite a constant churn of players and the loss of most of their stars, Saylor kept the Quakes on the winning path until they claimed the ultimate prize. Via David Barr at Beyond the Bricks; "Dodgers Impress in AFL — Farm System Winter Wrap: David Barr goes one-on-one with MLB Pipeline’s Jim Callis to discuss how Dodgers prospects performed in the Arizona Fall League." DB: He’s (Keibert Ruiz) in an interesting situation with the Dodgers. He and fellow highly thought of catching farmhand Will Smith have come up through he system together with Smith making it to Oklahoma City last season. 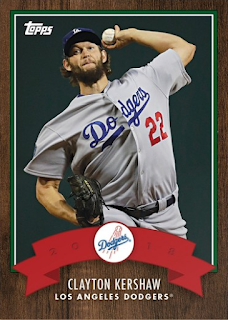 Now with Yasmani Grandal gone in free agency this is a battle to watch come the spring and next season. JC: I like Will Smith, but Ruiz is clearly the better prospect. Smith has struggled to hit in the Minor Leagues and that’s the one thing that Ruiz has shown he can do at a high level. I think Will is a more polished defender at this point and better receiver, but I really like Ruiz’s upside more and the fact that Ruiz is three and a half years younger than Smith says a lot too. I think Ruiz is the Dodgers catcher of the future. He’s probably a year away from being the everyday guy. "It was a 5 1/2 hour procedure. Everything went fantastic. They found the problem."